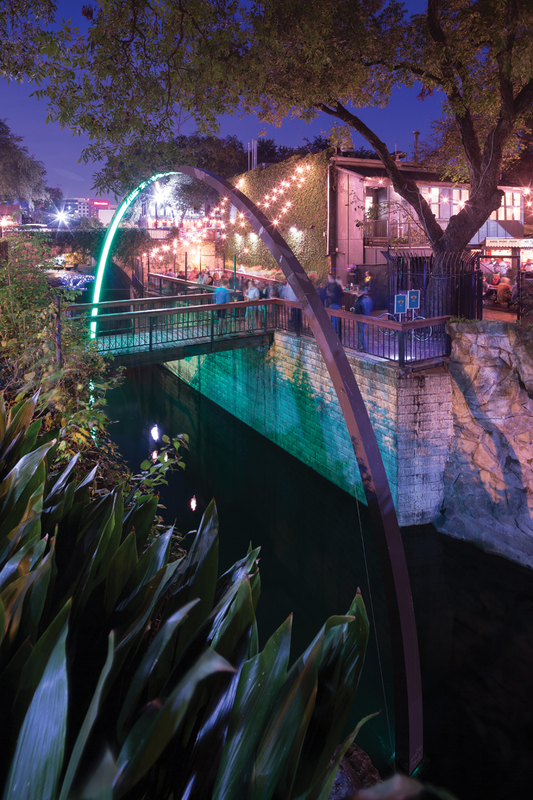 On most nights, an evening spent strolling the banks of Austin’s Waller Creek offers the chance to appreciate one of the many pockets of the city that is undergoing a rapid transition. 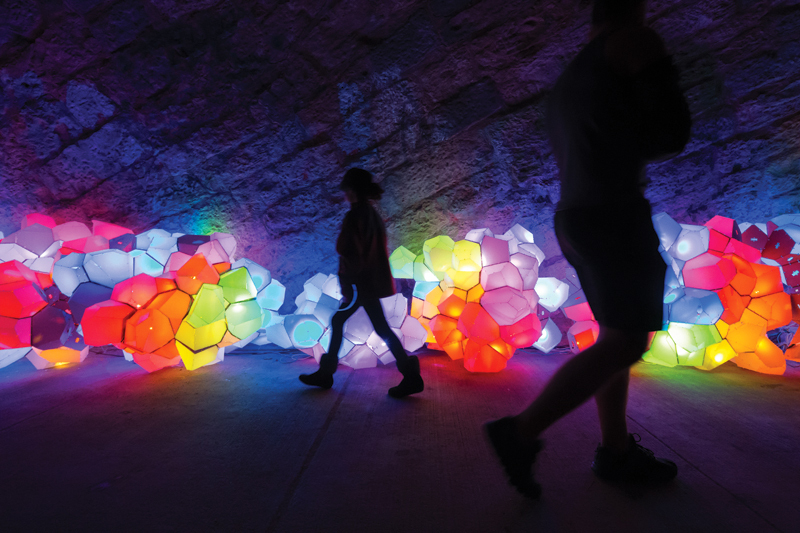 At no time is that more apparent than during “Creek Show,” an annual display of temporary light-based design installations from local architects, landscape architects, and visual artists. 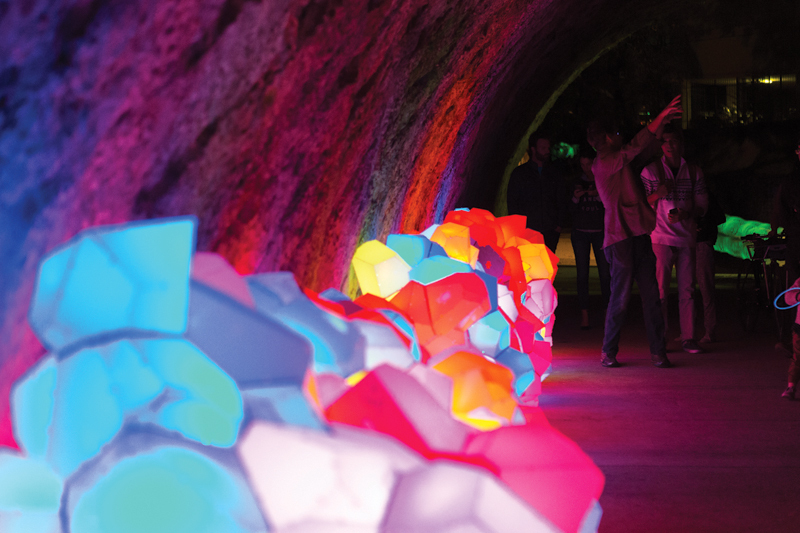 Organized by the Waller Creek Conservancy, the free, 10-day event has drawn thousands of curious visitors since its inception in 2014. 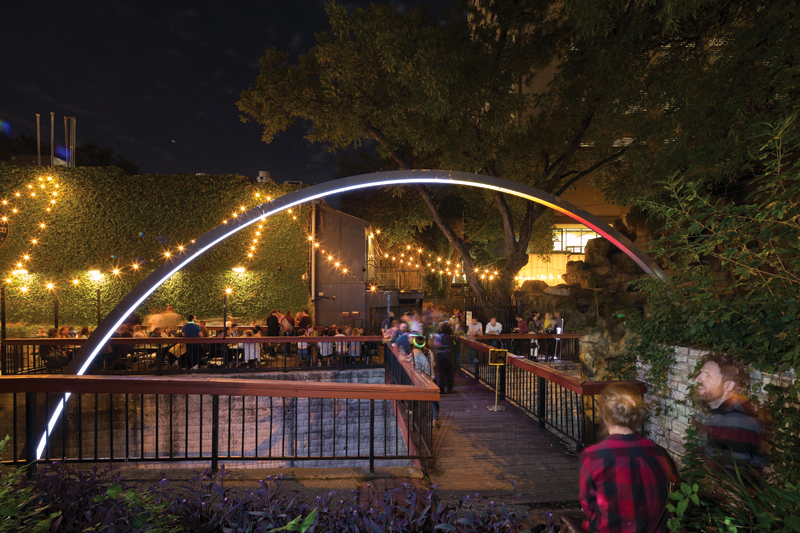 Meandering from north to south, Waller Creek parallels Shoal Creek to its west, together bookending the city’s downtown core. It weaves through The University of Texas at Austin, passes by the State Capitol, and wiggles through the dense, downtown grid before emptying into Lady Bird Lake, mere blocks from the bustling Rainey Street entertainment district. In a city in which many of the public nodes span east to west, it is a natural linchpin within Austin’s ever-greening urban fabric. It is no coincidence that this portion of the creek is in the midst of realizing a dramatic and ambitious master plan by Michael Van Valkenburgh Associates and Thomas Phifer and Partners, one that will see the flood-prone waterway transformed into a series of public parks, bridges, and outdoor performance venues. Evidence of this transformation is unavoidable, as a pair of exposed, above-grade corrugated diversion pipes temporarily snakes its way through the creek bed, held in place by occasional berm-like caliche-packed mounds spaced every few dozen feet. At the northern extent of Creek Show, the inner volume of this lumpy, infrastructural creek serpent serves as the inspiration for the first of five dazzling follies spanning the distance between 5th and 8th Streets. From within the bowels of the unassuming, coupled pipes springs “Phantom Diversion,” by Alisa West and Travis Cook of Westshop | Cookshop. Three long sections of coiled, HDPE UV reactive tubing rest just above the water level, anchored in place by a fleet of laser cut steel connectors welded to 34 segments of submerged steel tube and rod tracks. In total, the 768 helical sections of tube combine for a whopping 3,840 total feet of coiled material. The tubes radiate lime green under a blanket of soft purple ultraviolet light, subtly undulating in response to the cadence of the water. By celebrating the temporal nature of the infrastructure from which its form was derived, “Phantom Diversion” seeks to “highlight the complexities of the natural and built world and their often-overlooked interdependence on each other,” according to Cook. 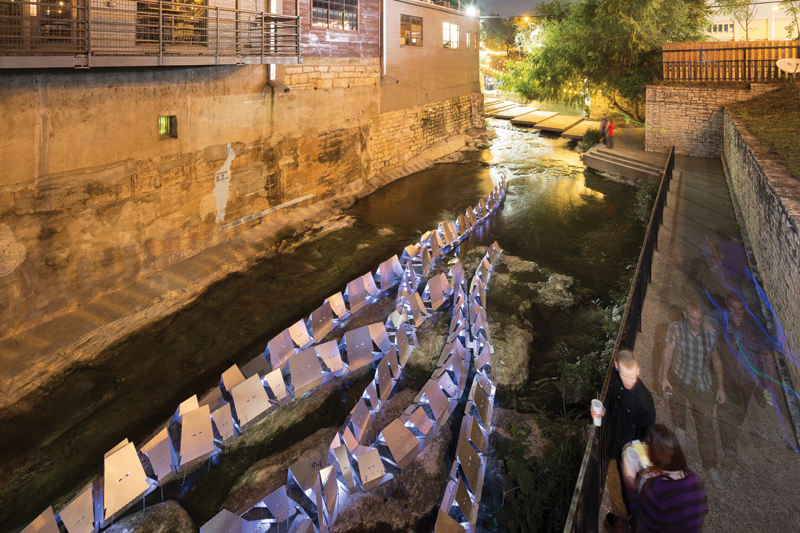 The installation, while reinforcing the trajectory of the creek itself, also serves as a seductive link to the remaining works. 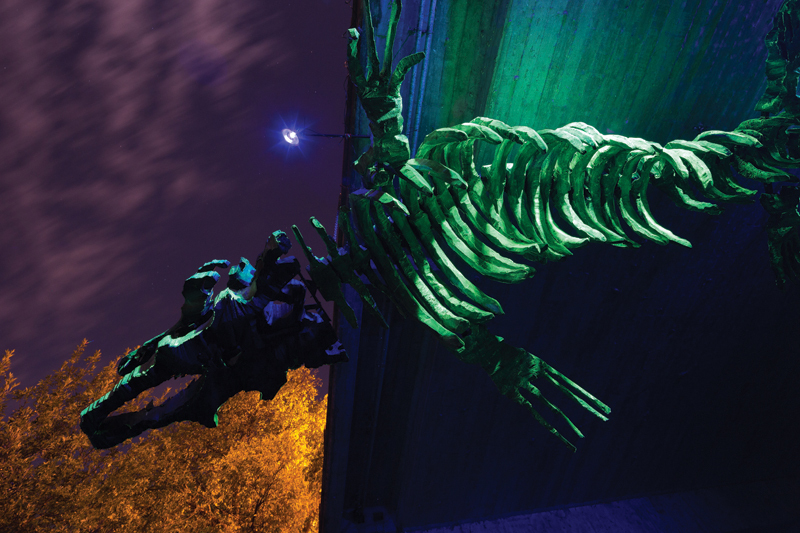 Heading south, visitors crane their necks to gawk at a 36-ft-long glowing Mosasaur skeleton levitating beneath the 8th Street bridge. “Invisible and Absolute,” by Jules Buck Jones, depicts an ancient, carnivorous sea lizard that swam through the shallow waters that covered central Texas between 65 and 100 million years ago. Beefy, wire-cut foam blocks, reclaimed from docks on Lake Travis during peak drought, are sprayed with truck bed liner and coated with a wash of luminescent paint to form the monster’s modular skeleton. A metal armature with hinged connections links the components and allows for suspension of the piece. Following the flow of the water, the barrel-vaulted tunnel below 7th Street is home to the next discovery, a waist-high abstracted blinking cloud running nearly the full length of the covered space. A series of programmable light-emitting diodes weaves through individual volumes of faceted chipboard and semi-opaque acrylic. Each laser-cut geometric face is held in place with several simple plastic zip ties that seem to vanish when viewed at a short distance. The multi-colored “Nimbus Cloud” is the brainchild of Autumn Ewalt and Dharmesh Patel, Assoc. 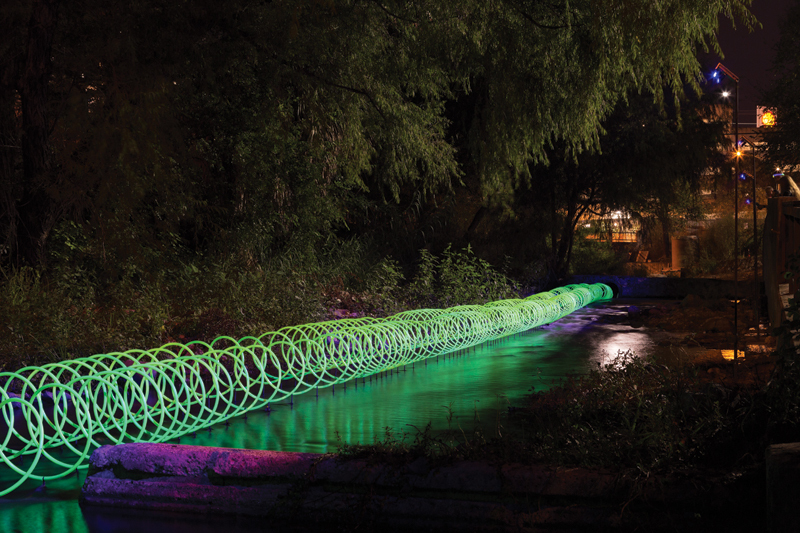 AIA, of Animalis, and reflects “the vitality of Waller Creek and the nature that surrounds it.” The piece pays homage to the creek’s role as a watershed, collecting precipitation from a six-mile area and siphoning it into Lady Bird Lake. The work is as mesmerizing as it is calm, its flickering and warm glow reminiscent of the magnetism of a campfire on a cold night. Visitors linger, many pausing for pictures, at this midpoint of Creek Show. 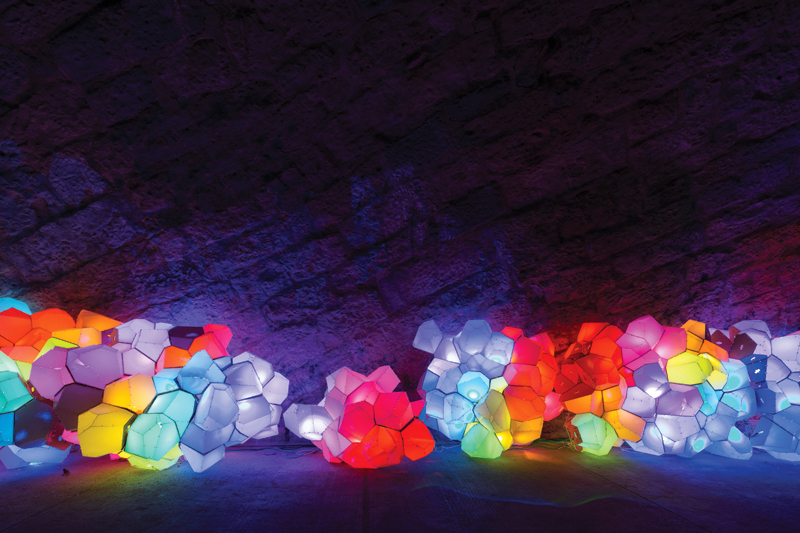 The parametrically designed and internally lit sculptural components vary slightly from each other, yet aggregate to form a composition that feels simultaneously organic and alien, two-dimensional and three-dimensional, a kit of parts and a continuous whole. Just south of 6th Street, “Deep Curiosity” defines the southern boundary of Creek Show. The heroic arch, composed of bolted steel sections and lit from within by strands of LED rope, balances impossibly on slender footings. Its impressive vertical scale is only exaggerated by the deep and narrow trench that it occupies. Vaulting from the water’s depths, its glowing inner face of diffuse acrylic leaps over a short pedestrian bridge before plummeting perfectly back down to earth. In the comparatively still waters of this portion of the creek, its reflection provides the illusion that the arch is not an arch at all, but rather a partially submerged, completed circle. 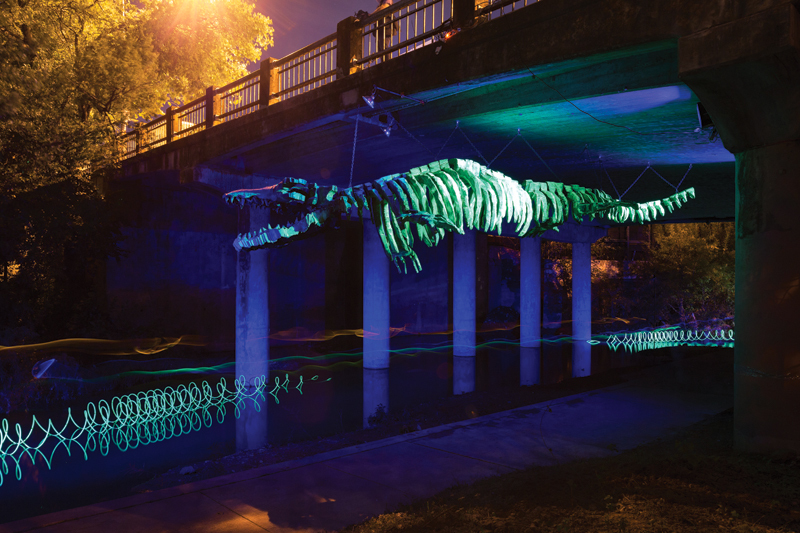 While varying widely in concept and execution, the five installations collectively embody the resplendent potential of Waller Creek. And judging by the droves of visitors who descended upon its banks for ten nights in November, the popularity of Waller Creek, and not its water level, is sure to continue rising. Christopher Ferguson, Assoc. AIA, is a designer at Clickspring Design and co-founder of DO.GROUP DESIGN.